The SanDisk USBtv enables you to quickly transfer video files onto the device, and then plug it into your television just like a DVD player..
SanDisk 's forthcoming USBtv device will slay the Apple TV and other media streamers. That's according to SanDisk engineer Lance Carpenter. USBtv is a powerful and innovative new platform that will enable consumers to transport downloaded digital content from a personal computer by using a small flash memory-enabled media player, and plug-and-play it directly on virtually any TV. Carpenter believes this USB-interfaced device could eradicate the need for burning DivX-style movies onto blank DVDs, and will prove a quick-and-easy alternative to media streaming. Carpenter told Tech.co.uk: "The USBtv is a really unique idea, there's nothing else like it. With the onboard codecs it makes getting video from your computer to your TV very simple. "There is nothing else in the market today - you have to go through conversion programs, burning this and that, make sure you have the right codecs on the CD blah blah blah. But with the SanDisk USBtv: plug it into a USB port, drag and drop the file onto the drive, then plug it into your TV and you're instantly watching. Easy as that." Carpenter said that rival products such as the Apple TV are trying to be too complicated, whereas the USBtv can deliver great results with minimal effort. "We wanted to just make something very simple so people will be able to get their video from their computers to your big TVs. It takes no configuring - it's just drag, drop and go." We were given a demonstration of the USBtv in action and the quality of standard DivX vidoes played through a television is very impressive. 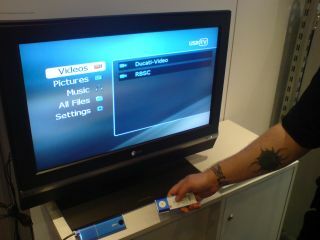 Not only that, but the USBtv comes with a slide-out remote for easy control. SanDisk has billed this as a DVD player for downloaded and other digital content, and they're not far wrong.